The initial treatment of acute traumatic proximal tibiofibular dislocation in anterolateral direction is closed reduction, the posteromedial dislocation requires open reposition and temporary fixation. Department of Orthopaedic Surgery, Haukeland University Hospital, Jonas Lie Vei, 5021 Bergen, Norway. Introduction: Acute traumatic dislocation of the proximal fibula occurs in an anterolateral, posteromedial, or superior direction. The dislocation is seen both isolated and in combination with other injuries of the leg. A dislocation is an uncommon injury. We have recently treated three patients with this injury which we believe will illustrate some treatment aspects. Case 1: A 25-year-old man fell in a football match. He had pain in his leg especially proximally. There was a prominent fibular head on inspection. X-rays showed an anterolateral dislocation in the proximal tibiofibular joint. The dislocation was treated by closed reduction under spinal anesthesia. The joint was stable when tested subsequently. He avoided weight bearing for 2 weeks. At 6 months follow-up, the patient played football at the same level. Case 2: A 63-year-old man caught his right foot in a net and fell immediate pain and minimal swelling proximally on the leg. It was diagnosed as a tibiofibular dislocation. A computed tomography (CT) scan was conducted to confirm a dislocation in an anterolateral direction while waiting for surgery, the dislocation spontaneously reduced. The patient was treated with a cast, with non-weight bearing for 2 weeks. Six months after injury, the patient was without symptoms. Case 3: A 45-year-old woman got a large object on the proximal part of her right leg. She had an open wound over her proximal fibula. We found a posteromedial dislocation. Through the wound, the fibular head dislocation was reduced and temporarily (for 6 weeks) fixated with a screw. At 6 months follow-up, there was no restriction of movement in the knee and the proximal tibiofibular joint was stable. She still had occasional pain with full weight bearing. Conclusions: Anamnesis and clinical examination usually provide the diagnosis of proximal tibiofibular dislocation. X-ray (and CT scans) examination may be helpful. The treatment of acute traumatic dislocation is closed reduction. Open reposition and temporary fixation are required if closed reduction fails or if the joint is unstable (after reduction) and in the case of posteromedial dislocation. The prognosis is good if the joint is stable after closed reduction. Keywords: Dislocation, proximal fibula, tibiofibular joint. 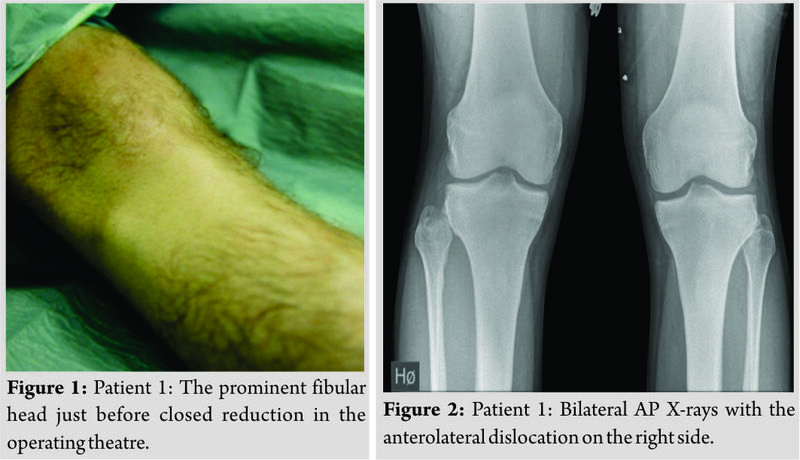 Acute traumatic dislocation of proximal fibula occurs in an anterolateral, posteromedial, or superior direction. The dislocation is seen both isolated and in combination with other injuries of the leg . Anterolateral dislocations occur most frequently and can be caused by a fall or twist where the ankle is inverted and in plantar flexion while the knee is in flexion (case 1 and case 2) [2, 3]. This mechanism, and therefore these injuries are seen in various sports. The posteromedial dislocation is often caused by a direct trauma to the fibular head (case 3) . From 1974 to 2014, there are about 30 cases mentioned in the literature . We have recently treated three patients with this rare injury, which we believe will illustrate some treatment aspects. A 25-year-old man had a fall during a football match where his right leg was trapped under his body. He had pain over the ankle and especially proximally in the leg. Inspection revealed a prominent fibular head (Fig. 1). Stability testing of the right knee showed no instability and the peroneal nerve was intact. X-rays (of both legs/knees) showed an anterolateral dislocation in the proximal tibiofibular joint (Fig. 2). The dislocation was treated with closed reduction under spinal anesthesia. The joint was then stable when tested. He avoided weight bearing for 2 weeks. At 6 months follow-up, the patient played football at the same level as before the injury. A 63-year-old janitor caught his foot into a net and fell. He experienced immediate pain and minimal swelling proximolateral on the leg. Stability testing of the right knee joint showed no instability and the peroneal nerve was unaffected. The injury was diagnosed as a proximal tibiofibular dislocation. Following a failed reduction attempt under local anesthesia, a computed tomography (CT) scan was conducted which showed dislocation in an anterolateral direction (Fig. 3). While he waited for surgery, the dislocation reduced spontaneously with a marked “pop.” A new CT scan showed that the fibular head was back in place (Fig. 4). The patient had after-care with a long-leg plaster of Paris for 2 weeks and no weight bearing. After plaster removal, full weight bearing was allowed and 6 months after injury, the patient was symptom-free. A 45-year-old woman was walking her dog when she got a large sheet of wood on the proximal part of her right leg. Stability testing of the right knee joint showed no instability and there was no peroneal nerve palsy. She had surgery for a lateral malleolar fracture. Peroperatively, we found an unstable, posteromedial dislocation of the fibular head. Through a deep wound (Fig. 5), the fibular head dislocation was reduced and temporarily (for 6 weeks) fixated with a screw (Fig. 6). Postoperatively, she developed a moderate form of complex regional pain syndrome that led to a slow recovery. She was non weight bearing for 6 weeks because of her malleolar fracture. At 6 months follow-up there was no restriction of movement in the knee and ankle. The proximal tibiofibular joint was stable. She still experienced occasionally some pain with full weight bearing. A traumatic dislocation of the tibiofibular joint is an uncommon injury, comprising <1% of all knee injuries . Anterolateral dislocations are most common (85%), followed by posteromedial (10%) ,and superior (2%) .The literature has mentioned about 140 cases (108 +30) from its first description in 1874 until 2014 [1, 4]. They are mostly related to sporting activities . Left untreated, the patient may experience chronic pain and instability in the knee, abnormal gait and reduced sporting performance . Injury to the common peroneal nerve (transient) is rarely (5%) seen especially in posteromedial dislocations [3, 8]. A high index of suspicion is required in traumas with lateral knee symptoms and inability to bear weight. The mechanism of the injury and adequate physical examination will lead to right diagnosis. Bilateral AP X-rays (as in our patient 1) may be helpful, but the best option is to perform a CT scan (or magnetic resonance imaging) as we did in our patient 2. The function of the common peroneal nerve should be noted. The best treatment in an acute setting is not known yet. There is some agreement that the initial management of an acute traumatic anterolateral dislocation should be closed reduction (direct posterior pressure to the dislocated fibular head with the knee in (full) flexion and the foot externally rotated, in dorsiflexion and everted) . Others recommend immediate mobilization with the intention to provoke spontaneous reduction . We used spinal anesthesia in our patient 1, but one could try to reduce the dislocation first under local anesthesia in combination with muscle relaxation. This failed in our patient 2. There is no consensus as to the method or duration of immobilization or the weight-bearing status following closed reduction [4, 9]. 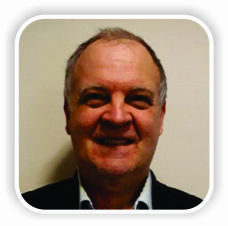 There is at present no clear evidence for restriction of weight bearing or immobilization after a successful closed or spontaneous reduction . We did not use anyspecific post reduction rehabilitation protocol. Open reduction (with primary repair of the ligament structures) and (temporary) fixation are required if the closed reduction fails . In an acute setting of joint instability after closed reduction, the most common surgery described is also open reduction combined with (temporary) fixation . There is also no consensus as to the method and the duration of the temporary fixation. This varies between Kirschnerwire(s), pin(s), or screw(s) for 3–26 weeks in the literature [4, 11]. In our patient 3, we chose one-screw fixation for 6 weeks, with full range of motion in the knee and full restriction of weight bearing as long as the screw was in place, which we thought was a reasonable protocol based on the existing literature. We have no reason to believe that the residual symptoms in patient 3 were caused by our setup. We have a recorded 6 months follow-up of all three patients. After several years, none of these patients contacted our department/hospital, the only in the region treating these conditions. We have therefore reason to believe that there is no changing or worsening of the patients’ complaints after this first 6 months follow-up. Dislocations of the proximal fibula are rarely seen. 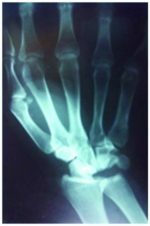 The anterolateral dislocation is most common. Anamnesis, mechanism of the injury, clinical examination, and high index of suspicion usually provide the diagnosis. X-ray examination (especially bilateral AP) may be helpful. If in doubt about the diagnosis, a CT scan is the best option. Treatment of acute traumatic dislocation is closed reduction during muscle relaxation. 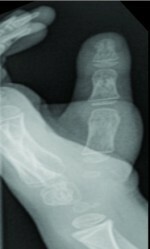 Based on the literature and our limited experience, open reduction, and temporary fixation are required if closed reduction fails, if the tibiofibular joint is unstable (after reduction) or in the case of a posteromedial dislocation and of course, when there are progressive neurological symptoms of the common peroneal nerve. The prognosis is good if the tibiofibular joint is stable after closed or spontaneous reduction. Posteromedial dislocation gives more frequent complications. The treatment of acute traumatic proximal tibiofibular dislocation is closed reduction. Open reduction and temporary fixation are required if closed reduction fails, or if the joint is unstable (after reduction) and in the case of posteromedial dislocation. 1. Ogden JA. Subluxation and dislocation of the proximal tibiofibular joint. J Bone Joint Surg Am 1974;56:145-54. 2. Halbrecht JL, Jackson DW. Recurrent dislocation of the proximal tibiofibular joint. Orthop Rev 1991;20:957-60. 3. Ahmad R, Case R. Dislocation of the fibular head in an unusual sports injury: A case report. J Med Case Rep 2008;2:158. 4. Weme RA, Somford MP, Schepers T. Proximal tibiofibular dislocation: A case report and review of literature. Strategies Trauma Limb Reconstr 2014;9:185-9. 5. Horan J, Quin G. Proximal tibiofibular dislocation. Emerg Med J 2006;23:e33. 6. 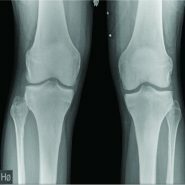 Goldstein Y, Gold A, Chechik O, Drexler M. Dislocation of the proximal tibiofibular joint: A rare sports-related injury. Isr Med Assoc J 2011;13:62-3. 7. Chiu C, Sheele JM. Isolated proximal tibiofibular dislocation during soccer. 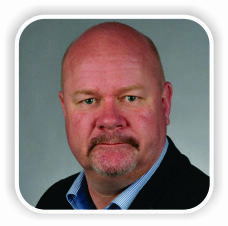 Case Rep Emerg Med 2015;2015:657581. 8. Lyle HH. Traumatic luxation of the head of the fibula. Ann Surg 1925;82:635-9. 9. Burke NG, Robinson E, Thompson NW. An isolated proximal tibiofibular joint dislocation in a young male playing soccer: A case report. Cases J 2009;2:7261. 10. Ashraf MO, Jones HM, Kanvinde R. Acute traumatic fracture dislocation of proximal tibiofibular joint: Case report and literature review. Injury 2015;46:1400-2. 11. Kruckeberg BM, Cinque ME, Moatshe G, Marchetti D, DePhillipo NN, Chahla J, et al. Proximal tibiofibular joint instability and treatment approaches: A systematic review of the literature. Arthroscopy 2017;33:1743-51. How to Cite This Article: Krukhaug Y, Schrama J C. Acute traumatic proximal tibiofibular dislocation: Treatment of three cases. Journal of Orthopaedic Case Reports 2019 Jan-Feb; 9(1): 98-101.